When you learn how to make a holiday cake recipe you will find that quite often it can be baked in a bundt cake pan. This is because all your fruit and nut cakes are typically thought as being for the holiday season. This can be very easy to make and do not require a frosting recipe to enhance the flavor and moistness. After learning how to make holiday cake recipes you will find that many of the most popular will be for fruit cake recipes. They might be called dark fruitcakes or light fruitcakes. They could be made with dried fruits, canned fruit or even fresh fruits; they usually include some type of nuts. Some of the recipes might contain alcohol like bourbon or rum. By experimenting with the recipes you can’t help but to find a favorite. If you are learning how to make holiday cake recipes, another group which are often baked for the holiday are pound cake recipes. They are baked in Bundt cake pans, sometimes in tube cake pans also or in the miniature size Bundt cake pans. These are very pretty and offer a nice presentation for the holidays. Drizzle a little icing over the top, sprinkle a few red and green cut up cherries on top and you can even add a candle in the center; simple but elegant. Grease, line with parchment paper, grease again and flour 3 nine inch round cake pans. Sift together the flour, cocoa powder, baking powder and salt; set aside. Cream together the butter and sugar; add eggs beating until fluffy. Add flour mixture to creamed mixture alternating with the juice or milk. Add vanilla; stir in the walnuts until well blended. Divide batter evenly among the three prepared baking pans. Bake about 35 minutes or until a pick comes out clean. Cool 10 minutes; remove from pans and cool completely. Melt chocolate over hot water (not boiling) in top of double boiler; cool before adding. Cream butter until light and fluffy; gradually beat in half of the powdered sugar. Stir in the chocolate, vanilla and salt. In a clean separate bowl beat the egg whites until stiff but not dry. Slowly add remaining powdered sugar beating until stiff peaks form. 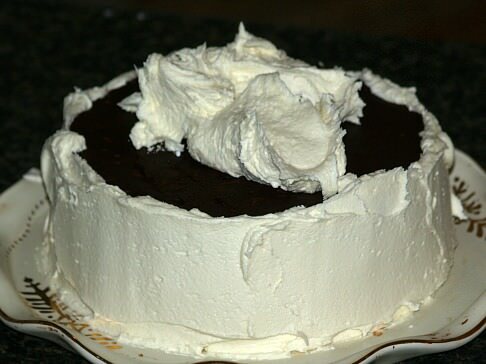 GENTLY fold egg white mixture into the chocolate mixture so as not to reduce volume. NOTE: My chocolate mixture was very thick and dry. I began scooping the egg white mixture into the chocolate mixture while still beating. When my chocolate mixture got to a smooth spreadable consistency, I folded in the remaining egg white mixture. Spread frosting between layers, on top and sides. 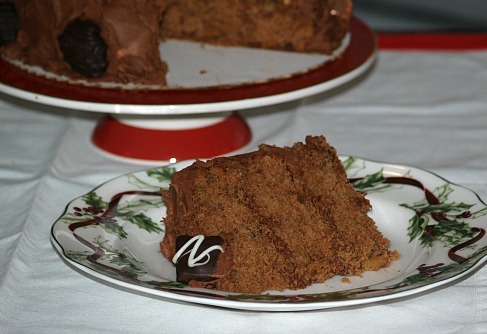 This is a nice holiday cake recipe to serve with coffee after all the other sweet goodies. Sift together sifted flour and all dry ingredients; make well in center. Add oil, egg yolks, coffee and vanilla; beat on high speed 5 minutes or until very smooth and creamy. In large mixing bowl beat egg whites and cream of tartar; beat on medium speed until stiff peaks form. Pour batter in thin stream over egg whites; fold in gently. Pour into ungreased 10 inch tube pan; bake in preheated oven at 325F degrees for 70 minutes. Invert cake and cool in pan completely; frost. Cream butter in mixing bowl gradually adding about half of sugar. Beat in 2 tablespoons coffee and the vanilla. Gradually blend in remaining sugar adding enough additional coffee to reach spreading consistency. Make a great holiday cake recipe from this coconut bundt cake recipe; decorate with red and green cherries. Cream sugar and butter until fluffy; blend in shortening. Combine and mix dry ingredients; add alternately with milk to creamed mixture. Stir in vanilla and coconut; pour into well greased and floured Bundt cake pan. Bake 1 ½ hours; cool 10 minutes and remove from pan to rack to cool completely. You can’t go wrong with having orange in a holiday cake recipe. When I was young, we never had oranges all year round like we do today; only for the holidays. Preheat oven at 325F degrees; grease and flour tube pan. Cream Butter and sugar until fluffy; add eggs one at a time beating well after each. Sift flour, soda and salt; add to creamed mixture with sour cream. Blend in orange extract; fold in mandarin oranges. Pour into prepared pan; bake 90 minutes or until pick comes out clean. If desired top with glaze and decorate. (Does not need frosting). (Someone sent this to me many years ago; I believe it came from Southern Living Magazine. 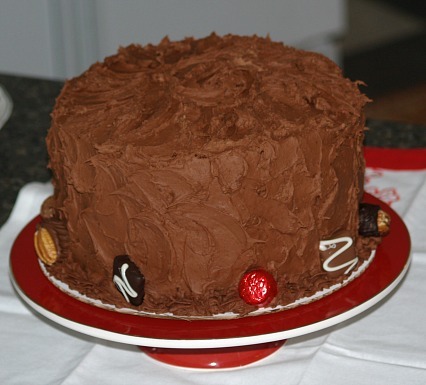 It is a little more time consuming but it makes a SPECTACULAR HOLIDAY CAKE RECIPE. These cookies should be prepared ahead of time; they can be frozen. It is worth making this recipe because they add to the presentation of this holiday cake recipe. Beat butter and sugar until light; add egg yolk and vanilla and beat until creamy. Combine flour and salt; gradually add to butter mixture while beating on low. Beat on high speed 2 minutes; divide dough into 3 parts and shape into balls. Wrap each ball in plastic wrap and chill for 1 hour. Line 3 baking sheets with parchment paper; sprinkle lightly with flour. Roll 1 part of the refrigerated dough at a time on a lightly floured surface. Roll ¼ inch thickness to a 9X6 inch rectangle. 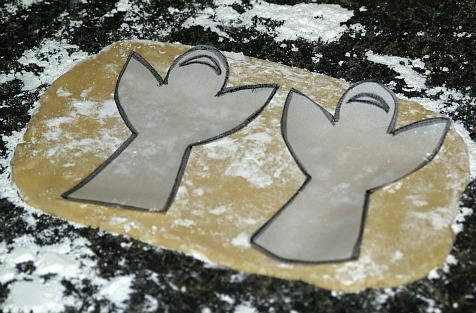 Place angels 3 inches apart on baking sheets; freeze angels on baking sheets for 15 minutes. Beat together egg and cream; brush mixture lightly over angels and stars. Sprinkle cookies with sparkling sugar; bake for 20 minutes or until golden. Cool in pan for 10 minutes and cool completely on rack; decorate as desired. 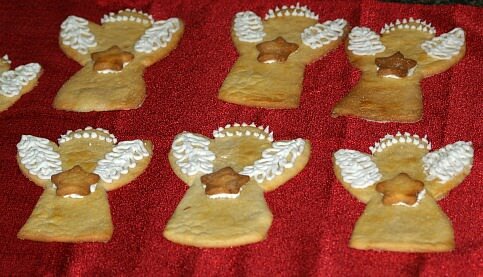 NOTE: Angels are 5 1/2 inches from top to bottom; 2 3/4 inches across the bottom; 4 inches wings span. Preheat oven to 350F degrees; grease and flour three 8 inch round cake pans. Beat butter on medium speed until creamy; add sugar beating well. Combine and sift flour, soda, salt and cocoa powder. Add flour mixture to butter mixture alternating with sour cream; blend well on low speed. Divide batter evenly among the prepared cake pans; makes 6 cups of batter, 2 cups each pan. Bake cakes 18 to 20 minutes until pick comes out clean. Cool in pans 10 minutes; remove from pans and cool completely on rack. This part of the recipe adds to the rich delicious flavor of this holiday cake recipe. Heat cream and chocolate over medium heat stirring until chocolate melts and mixture is smooth. Remove from heat and whisk in butter and liqueur; let stand 20 minutes. Heat over very low chocolate pieces and ¼ cup of cream stirring until chocolate melts. Beat butter with 1 cup of powdered sugar on low speed until blended. Add remaining sugar alternating with remaining cream until blended. Add chocolate mixture and vanilla; beat on medium speed until spreadable consistency. This is how to make a wonderful and unique holiday cake recipe. 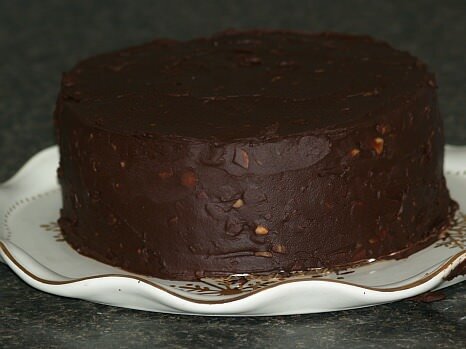 Spread a thin layer of CHOCOLATE PRALINE TRUFFLE recipe between cold cake layers and on top and sides of cake. Cover and chill at least 2 hours. Prepare WHITE CHOCOLATE BUTTERCREAM FROSTING; reserve 1 ½ cups. Spread remaining frosting on top and sides of cake. Spoon reserved frosting into a pastry bag with a tip; pipe around the base of the cake creating a ruffle. 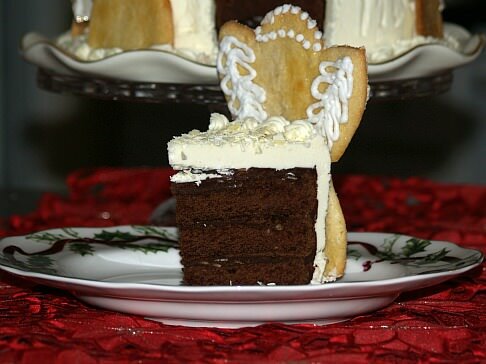 To place ANGEL COOKIES pipe a little bit of frosting on the back of each angel cookie; press the cookies on sides of cake spacing them evenly about ½ inch apart. Cut WIRE RIBBON into 6 four inch lengths; crumple slightly. 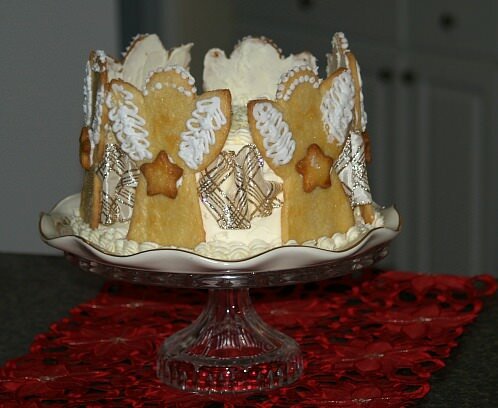 Place each piece against the sides of cake between each pair of angel cookies tucking ribbon under angels. Sprinkle SHAVED WHITE CHOCOLATE on top of cake; serve at room temperature.